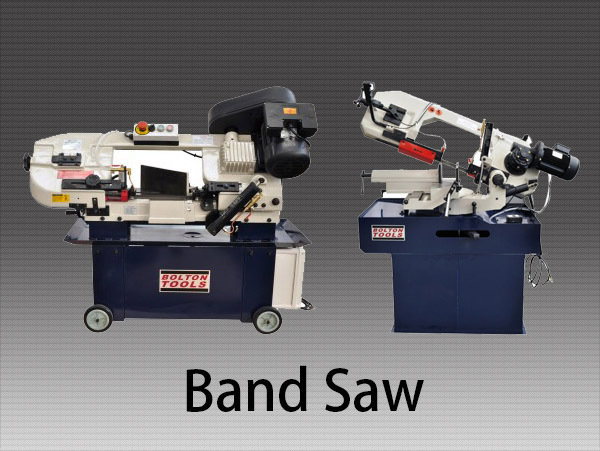 A bandsaw is a power tool which uses a blade consisting of a continuous band of metal with teeth along one edge to cut various workpieces. It's also a useful machine in a woodworking shop. The band usually rides on two wheels rotating in the same plane, although some bandsaws may have three or four wheels. Bandsawing produces uniform cutting action as a result of an evenly distributed tooth load. 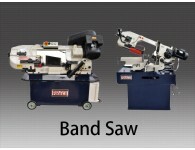 Bandsaws are used for woodworking, metalworking, or for cutting a variety of other materials. They are particularly useful for cutting irregular or curved shapes, but can make straight cuts. The minimum radius of a curve that can be cut on a particular saw is determined by the width of the band and its kerf. A cold saw is a sawing machine that uses a circular saw blade to cut metal. 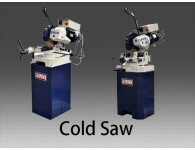 The name "cold saw" comes from the cutting process they employ. These sawing machines transfer the heat generated by cutting to the chips created by the saw blade. Therefore, the blade and material being cut remain cold, unlike an abrasive saw, which abrades the metal and creates a great deal of heat in the metal and cutting blade. 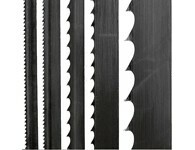 Cold saws use either a solid high speed steel (HSS) or tungsten carbide-tipped, resharpenable circular saw blade. They are equipped with an electric motor and a gear reduction unit to reduce the saw blade's rotational speed while maintaining constant torque. This allows the HSS saw blade to feed at a constant rate with a very high chip load per tooth. 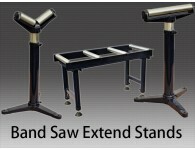 A cold saw cut produces minimal burr, no sparks, no discoloration and no dust. The material being cut must be mechanically clamped to prevent movement during the cutting process. Extra care should be taken to choose the appropriate number of teeth, saw blade type, cutting speed and feed rate. 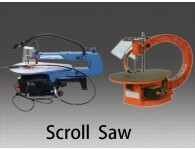 All of these variables are based on the type and size of material being cut. Cold saws are capable of machining most ferrous and non-ferrous alloys. 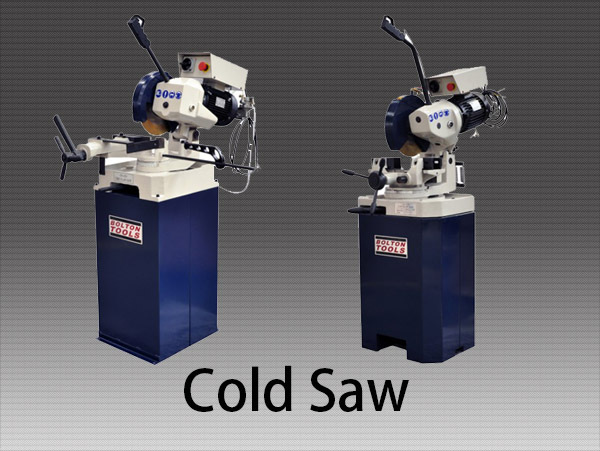 Cold saws are intended to be used with a flood coolant system to keep the saw blade teeth cooled and lubricated. An abrasive saw, also known as a cut-off saw or metal chop saw, is a power tool which is typically used to cut hard materials, such as metals. The cutting action is performed by an abrasive disc, similar to a thin grinding wheel. Technically speaking this is not a saw, as it does not use regularly shaped edges (teeth) for cutting. 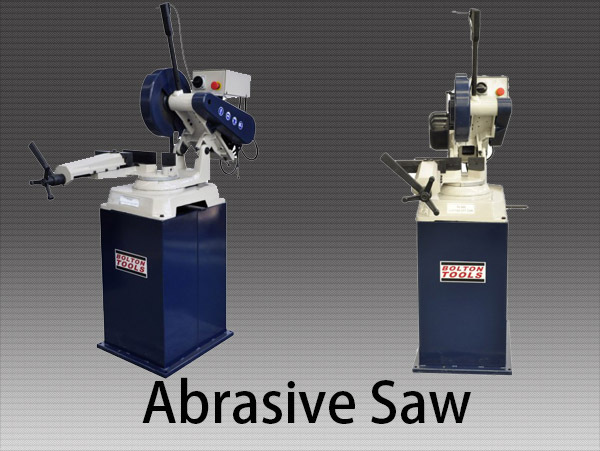 The abrasive saw generally has a built-in vise or other clamping arrangement, and has the cutting wheel and motor mounted on a pivoting arm attached to a fixed base plate. They typically use composite friction disk blades to abrasively cut through the steel. The disks are consumable items as they wear throughout the cut. 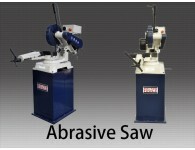 The abrasive disks for these saws are typically 14 in (360 mm) in diameter and 7⁄64 in (2.8 mm) thick. Larger saws use 410 mm (16 in) diameter blades. Disks are available for steel and stainless steel.Since their introduction, portable metal cutoff saws have made many building site jobs easier. With these saws, lightweight steel fabrication previously performed in workshops using stationary power bandsaws or cold saws can be done on-site. 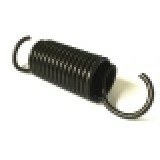 Abrasive saws have replaced more expensive and hazardous acetylene torches in many applications, such as cutting rebar. It is somewhat similar to a band saw, but unlike band saws, in which the saw blade is a continuous loop, scroll saws use saw blades similar to those of coping saws and operate through a quick reciprocating up and down motion. A scroll saw has two main advantages when compared to a band saw. The first is that the blade can be removed and placed in situ through a pre-drilled starting hole. This feature allows interior cutouts to be made without creating an entry slot for the blade through the edge of the workpiece. Second, a scroll saw can cut significantly more intricate curves. CS315/CS350 Slow Speed Cold Cut Saw w/Swivel Base Plate Spring - CS315350BP203 Qty. 2 ..